Pompey are set to be cheered on by around 2,500 members of the Fratton faithful for tomorrow's top-of-the-table clash at Peterborough. And Blues fans can still purchase tickets for the game until 4pm today. 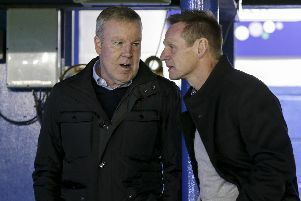 Kenny Jackett's men travel to London Road to face the Posh tomorrow (3pm). Second-placed Pompey trail Steve Evans' leaders by two points, but a win for the visitors would see them move to the summit of League One. The highly-anticipated clash has unsurprisingly proved popular among both the Fratton faithful and Peterborough supporters, with the match becoming an all-ticket affair due to demand. Blues fans who have yet to secure a seat for the game can do so until 4pm today. There are still 1,000 available and can be purchased from Pompey's Anson Road ticket office or by clicking here. Tickets cannot be bought on the day of the game.